Following the world of gymnastics one back handspring at a time. 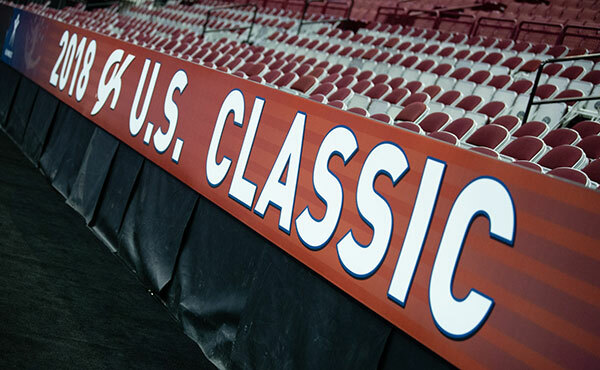 It's been a while, but I'm back, live blogging the GK US Classic. Right now, it's the junior session - featuring up and comers for 2020 such as Jordan Bowers, JaFree Scott, Sunisa Lee, Kayla DiCello & LeAnne Wong and so on. Refresh the page every five to ten-ish minutes or so. Someone's on beam, but I'm not sure who - ok it's Kaliya Lincoln. Abigail Scanlon FX - nice DLO to open, maybe some soft knees, sw + sw 1/2, lands double back a bit short, tour jete, nice dbl pike, dbl wolf turn but fell out of it a bit, wolf jump, a front twisting pass that I missed. Lauren Little VT - Big DTY, but lands off to the side and takes a step back. Why aren't they showing me Marz Frazier's little sister? I'm offended. SHOW ME SOME FINNEGAN ON BEAM DAMMIT! WHO IS RUNNING THIS FEED? THEY NEED TO BE FIRED! lovely bars set from Maeve Hahn, nice stalder full, dismounts with stuck fill in. Leanne Wong BB - side spl mount, sw + straddle jump beautiful, BHS + LOSO + LOSO, beautiful, L turn full, bhs + straddle 3/4 jump, side aerial, side somi, slight bobble, front aerial, + spl jump, round off + 3/1 twist, small hop to the side. Sorry, stepped away for sec to get food. I'm a hungry pregnant lady, food is everything. Rotation 2 to commence shortly. Someone on VT FTY, step back on landing - Title cards please USAG. Lauren Pearl VT - good powerful DTY. eMjae Frazier FX - triple wolf turn, clean, high double pike. I love her, she's a mini Marz. Aleah Finnegan started her floor routine with a beautiful double arabian to stag leap. Time for rotation 2b - they're warming up for that. Even my baby is offended by the lack of Finnegan and Frazier on the feed. He's moving around a lot in there. Kailin Chio VT - stuck an FTY. Very nice. Leanne Wong FX - dbl arabian _ stag leap + tuck jump full, beautiful triple ful, sw ring + tour jete 1/2, clean double pike, L hop full, double L turn + full turn, 2 1/2 to end. Levi Young UB- KCHS in bar + in bar 1/2 + pike jaeger, misses it, good HS giant 1/2 + pka, some leg spes, stadler + shap 1/2, full in, small step back. Kaliya Lincoln FX - dbl arabian, full in, small hop back, sw ring tour jete full, wolf turn 2/1, popa, 1 1/2 step out to dbl back. Jeffrey FX - dbl arabian, wolf tunr 2/1, dbl pike, L hop full, popa + spl 1/1, dbl back, stuck, chest down a bit maybe, triple full + spl jump. Mallory Marcheli VT - DTY, good, solid landing. Pearl UB - KCHS< g 1/2, looks like she was going for a release and then bailed, pike jaeger, clear hip + pak, toe shoot to HB, clean DBL back to finish. Finnegan VT - beautiful DTY, great form in the air, hop on the landing. Wong VT - DTY, clean and stuck and beautiful. Chio UB giant 1/2 = pike jaeger, stalder + bail, toe shoot to HB, giant full, DLO, stuck. Hannah Hagle lands dbl pike on her knees on FX, nice leap series, didn't quite catch it, wolf turn 2/1, 1 1/2 + 2/1 , crash lands dbl back on her knees. Ciena Alipio UB - stalder 1/2, got confused and came off the bar, shap + pak, nice, shap 1/2, very nice, toe on + toe 1/2 + pike jaeger, falls and her wrists take a beating. Syke Blakely UB - KCHS, in bar + in bar 1/2 + tkatchev pak, stalls, shap giant 1/2 giant 1/2 + stalder 1/2 + full in. Kayla DiCello FX - DLO, some leg seps, but very powerful, and clean landing, FHS + front 2/1, tour jete 1/2, wolf turn, 2/1 + wolf 1/1, 1 1/2 + 2/1 front, stuck her dbl back. Goodman VT - FTY, hop forward, chest a bit down. McClain FX - dbl pike, OOB, nice flexibility, a bit of attitude, 11/2 + front full, I love it, wolf turn ful, 2 1/1 + front tuck, sw ring + sw 1/2, nice split positions, triple full dismount. Bowers BB - sw ring chest down, bhs + bhs + dbl pike, chest a bit down on landing. step foward. No Finnegan on bars... REALLY? German VT - Big DTY, hop to the side. Amari Drayton FX - full in, small hop, chest a bit down on landing, but lots of power, 1 1/2 + front full, sw ring + sw 1/2, dlb back, double L turn 2 1/2 dismount. Young Ruivivar FX - 2 1/2 + front tuck. Bowers FX - beautiful DLO, steps out, but doesn't put heel down to go OOB, fhs + front dbl tuck, deep knee bend, lovely leap series, triple turn, lands full in on her knees :( NOOOOOOOOOO! double wolf turn and I'm not offended by it, FHS + front 2/1. The looks she gives, she seriously looks like a McKayla Maroney clone. Cally Swaney VT - FTY, some soft knees. Elizabeth Gatner FX - dbl pike, dbl back, small hop back, sw + tour jete 1/2, 1 1/2 + front lay, double L turn, 1 1/2. Abigail Scanlon dismounting with a triple full on beam. Love Birt FX - front lay + front full, spl jump full, dbl back, big bounce back and goes OOB, tour jete 1/2, sw ring + sw 1/2, wolf turn 1/1, dlb pike, big bounce out. Nault FX - double pike, dbl back, sw ring + tour jete 1/2. 1 1/2 + front full, double L turn + L turn full, rudi - interesting floor music, it was "Bare Necessities" from the Jungle Book but with a dramatic interpretation and arrangement. That's all for me for now, come back at 6 p.m. Mountain time for the seniors! See you then for all the fun. Yesterday, US gymnast Maddie Desch announced her retirement from elite gymnastics via her Instagram account. Maddie, who trains at Great American Gymnastics Express, aka "GAGE" explained she came to the decision to retire due to a nagging injury that prevented her from training at the elite level. American Cup winner Katelyn Ohashi has been out of competition for a while due to injuries. Since she won the American Cup in March, she's been largely absent from the USA Gymnastics scene. In April, she turned down international assignments at the City of Jesolo Cup because she was recovering from shoulder surgery. She was absent from the national championships in August, presumably for the same reason.